Don’t be a Sucker in the heat- keep fluids up! No one likes getting caught short especially with a small child. More so when your child is thirsty and letting the world (very loudly) know all about it! There’s no need to panic, the Sucker has you covered. One thing is clear for babies, there’s no negotiating thirst – they want it now. Here’s where the Sucker comes into its own. In MacGyver-like fashion, all you need to do is grab any bottle of water, replace the lid with the Sucker attachment and, hey presto, instant refreshment! It’s extra reassuring too that in the heat of summer, if you’re out and about with no clean bottles or feeding equipment, you can still get extra fluids into your baby without having to dribble water via the bottle cap into their mouths. The Sucker fits most brands of bottled water and comes in its own carry container so you can throw it in your bag, car glove-box or pram pocket and not worry about it getting dirty. 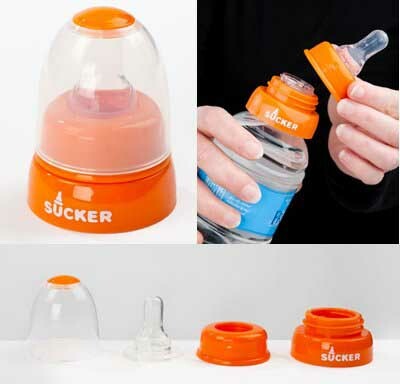 The Sucker is BPA free and so easy to use and clean, just like a normal baby bottle! You can get yours for $12.95 from Gear 4 Baby. Delivery is available Australia wide.